With one week left in the regular season and both the Mission League and Bay League playing championship tournaments, the Top 10 in the US Lacrosse/MaxLaxLA Coaches Poll remained unchanged after Week 8. Loyola received 15 first-place votes and remains No. 1, while Palos Verdes received 10 first-place votes and remains No. 2. Harvard Westlake, Chaminade and Oak Park follow, as they did last week. In fact, the first change in the ranking doesn’t occur until the 12th spot, with saw San Marcos move up one and Sierra Canyon drop a spot to No. 13. Village Christian also moved up two spots, while St. John Bosco dropped two spots. 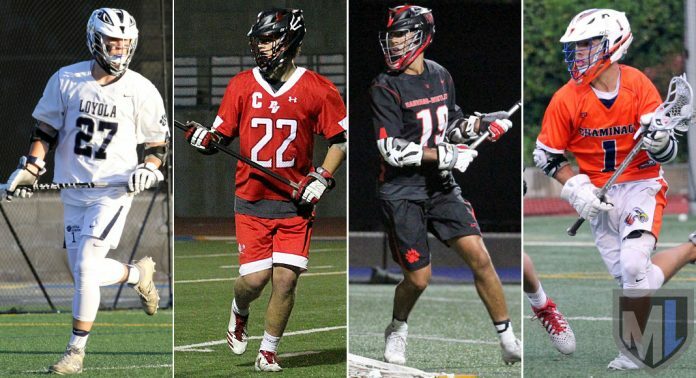 Those late-teens ranking sports are important only insofar as the US Lacrosse playoff selection committee use the coaches poll as one of a handful of criteria for deciding which teams have earned spots in the 16-team championship field and which remaining teams merit invitations to the eight-team Invitational Tournament. Playoff invitations and seeds will be determined at a meeting of the selection committee Sunday, April 29. Below are the results of the US Lacrosse/MaxLaxLA boys coaches poll after Week 8 of the regular season — the week ending April 21 — with 25 ballots submitted. Also receiving Top 20 votes: Redondo Union (8-6); St. Francis (6-10); El Segundo (5-8); Thacher (5-5).